Back in March my husband and I made a 5 minute decision to visit Beijing after seeing a sale on TV that was ending in 20 minutes. It was one of those excellent rash decisions. We had very few expectations, and maybe that’s the key, but Beijing is nonetheless a wonderland for the culturally curious. Ripped straight out of a travel guide and itself gradually ripping at its folded seams. It was heavily relied upon. In just one week, we managed to cram in the Lonely Planet’s top 10 sights, a dazzling kung fu/dance/sing-a-long arts performance, a visit to the National Art Gallery, loitering in local a grocery store where I discovered snack size vacuum-sealed chicken feet in a variety of flavours, ate a famous Peking Duck dinner, visited the notable Hutongs and walked 166, 201 steps. Regrettably, we didn’t make it to the Great Wall as the heavy rain in the days leading up to our planned visit made meant it was too slippery and dangerous, so The Wall was closed. How you close a wall, I’m not exactly sure but this was the official advice by young security personnel at the train station who were kind enough to find an English speaking Chinese tourist to translate this very useful information. Pro-tip – consider the weather when planning a visit to the Wall. Nevertheless, the 17(ish) tourist places that we did manage to see were definitively, awesome. Beijing was built to impress, and impressed I was. With a history so deep, architecture so bold, language that I found impossible to decipher past “ni hao” and “xiexie”, and customs that are so quintessentially Chinese, I felt like I’d taken the red pill and was seeing things anew. The Forbidden City. This was a palace for the Ming and Qing Dynasties before it became a museum in the 1920s. The palace goes on and on and on. It was magnificent at every turn. 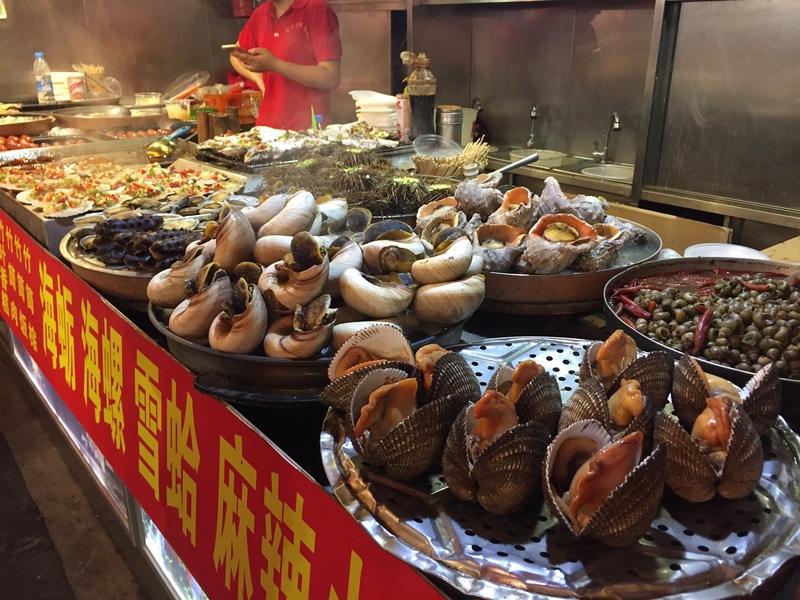 Wangfujing – I can guarantee you’ll see something you thought wasn’t edible being sold on a skewer in this famous street market. The Lama Temple – temple and monastery of Tibetan Buddhists. Wandering the Hutongs some more! Stay near the subway. Beijing’s subway system is world class, gets you to almost anywhere and it’s cheap! Buy a travel guide. If like us, you’re in Beijing for a limited time only – it really pays to have a guide book to give you an overall sense of the place and where to go. The great firewall of China means no Facebook, no Instagram, no Google. I didn’t see a single fork. Although there was a spoon sighting. You might like to practice your chopsticks skills before you go. The tourists in China are mostly Chinese. Most service staff we came across (apart from the hotel staff) spoke very little or no English. So learn a few phrases, take a translator or be prepared to use body language! We loved this trip so much and we’re looking forward to seeing other parts of China. Maybe next time we’ll get to see The Great Wall! Next Next post: To breed, or not to breed. That is the question.